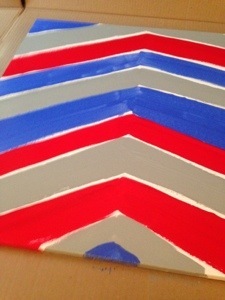 The craft project for Week 1 is a Chevron Drip Canvas. I did one several weeks ago and have received several compliments about it, so I thought I would do a another one and show the step-by-step. This canvas only took me between 3-4 hours to complete, and then I let it dry overnight. This is my first time attempting to explain my process, so if something doesn’t make sense, please let me know! Sorry in advance about the lighting on some of the pictures. I’ll work on that for future posts. various colors of acrylic paint – make sure it is the paint in the bottle, as shown below. Bottled paint is thinner than the paint that comes in the tube and this is necessary to make the paint drip. I chose red, blue, and grey paint to make my canvas University of West Georgia themed for my office. 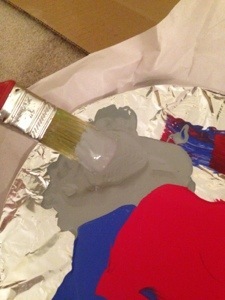 paint brushes and something to hold the paint – I used a plastic plate covered in tin foil. something to cover the floor while you paint – I used an old box, cut and spread apart. Use the yard stick and the chalk to measure out the high and low points of the chevron design. I use chalk because you can paint over it and never know it was there. If you mess up with the chalk, it’s no big deal! Just get a damp wash cloth and rub it on the messed up area and the chalk goes away. Pretty cool, huh?! I wanted to do a wide chevron, so I made a mark every 12 inches, giving me 3 lines total on the canvas. If you want more highs and lows in your chevron design, then do shorter measurements. Once you have done that on one end, turn the canvas around and make the marks on the other end. Be sure to mark a little on the top of the canvas so you can see it. 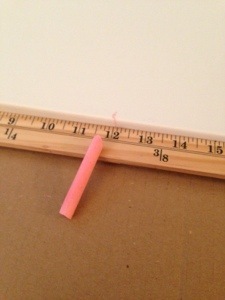 Now use the marks you just made and the yardstick to draw straight lines down the canvas with your chalk. This defines the high and low points of your chevron design. Now it’s time to start painting. It is very important to do this with the canvas lying flat. The first time I did this, I started with the canvas tilted up and had some premature drips that made it really difficult to do the second and third coats of paint under the drips. To make the chevron design, I picked a spot toward the middle on the left side of the canvas (I’m right-handed so I always go left to right) and started painting up toward my first chalk line. You can make the lines as steep as you want and as thick as you want. As you can see, I made some lines thicker than others. Once you hit the chalk line, it’s time to change directions and head down toward the other chalk line. 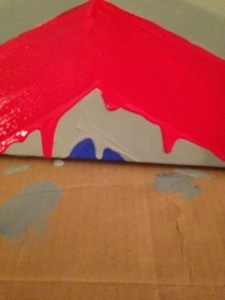 I did not worry about making sure the highs and lows of the chevron hit at the same point horizontally on the canvas. To me, it didn’t matter where on my vertical lines the points hit, as long as they hit somewhere on the line. With the drip technique, I personally don’t think it matters if the chevron is perfect, but if you do, make sure to use the chalk and the yard stick to create horizontal lines across the canvas to make each high/low for each color hit in the same place on the vertical line. It will take several coats of paint to get a smooth look, so for the first coat, we’re just worried about getting the design on the canvas. Because you’re using different colors, it’s good to leave a very small gap in between each color so that you can continue to paint the colors don’t run and smear into each other. We will fix the gap when we do our second coat. Also, since I did a random order of colors, I did not paint all the lines of one color before moving on to the next color. I painted my first line in blue, then did a red below and grey above. Then I continued to add one color below and one color above, which is why the small gap in between each line was so important. I didn’t have to wait for each line to dry before I did another color next to it. Don’t forget to paint around the edges as you go! This will be a huge lifesaver at the end. Let the paint dry a little before filling in the gaps. If you want to speed up the process, use a hairdryer on low on the edges of each line. 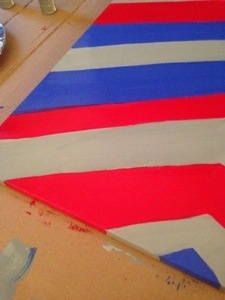 Once the edges are somewhat dry, you can go over each color again and fill in the gaps. It didn’t matter so much for these colors because they are all dark, but depending on what colors you choose, it is important to remember to go over your light colors first and then your darker colors. I still have a few very small gaps in between my colors but that can be fixed once we do the drips. 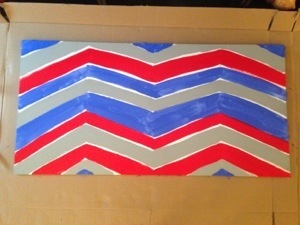 Here is what my canvas looks like with the finished chevron design. Again, it doesn’t have to be perfect because the drips will be all over the place. Now you will need to tilt your canvas up. Don’t set it up straight but make sure it’s at a slight angle. The box I used to cover the ground was pretty large, so I was able to bend the box where the bottom of the canvas hit it to make the box stand up as well. This gave coverage to the back of the canvas against my entertainment center and to the bottom of the canvas against the floor, so I’ve still got my painting area completly covered. Make sure to get a good amount of paint on the brush. Get a big glob. Put the brush near the edge of the line you are working on and press down to transfer the glob of paint on the brush to the canvas. At times, I had to rotate my brush in a circle while pressing it on the canvas to transfer the paint. You will see the drips starting to form. It’s okay if the drips don’t fall very fast. If you want really long drips, wet your paint brush with water and then squeeze most but not all of the water out before dipping it into the paint or add a few drops of water to the paint before dipping your brush. This will thin the paint a little more. 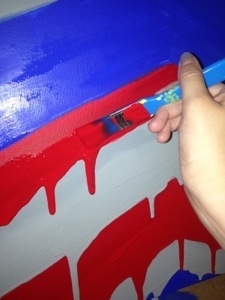 Don’t forget to smooth out the paint above the where you have placed the drips. Use this as an opportunity to do a third coat of paint on each line. The number of drips in your canvas is up to you! You can add as many or as few as you want. 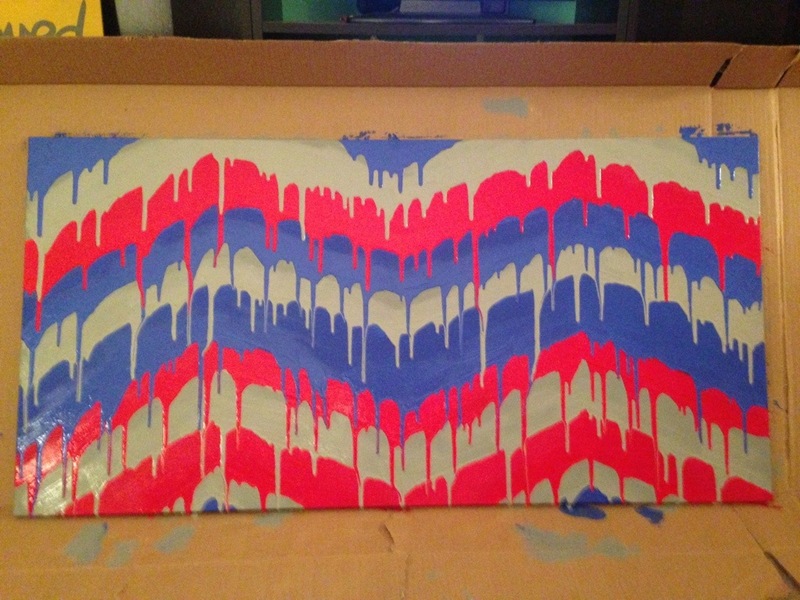 For this canvas, I wanted to do a lot of drips since I did a wide chevron design. And because the drip look is so messy, the fact that my chevron design wasn’t perfect doesn’t really matter. 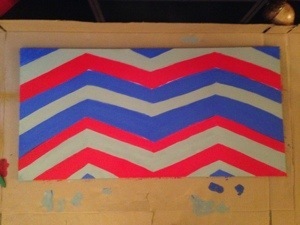 Continue the drip process for each chevron line from the bottom up, and VOILA! You have your finished Chevron Drip Canvas! Make sure to keep it on the box until it is completely dry. 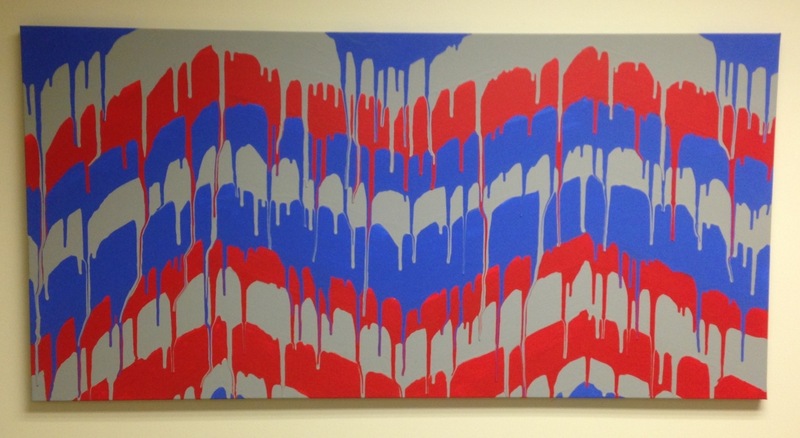 If you like the look of the drips, go ahead and lay the canvas flat again. If you want it to drip a little more, keep it at an angle but make sure it is tilted to where the bottom edge of the canvas is getting air so it will dry. 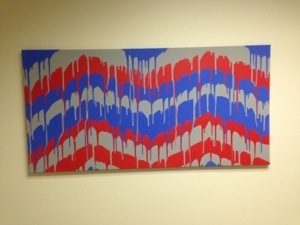 Looking at both of the drip canvases I have done, you can see the differences. On my first drip canvas (left), I used the same size canvas but used 6″ measurements for my vertical lines because I wanted the chevron design to be more narrow. While I still didn’t make my chevron design look perfect by measuring out horizontal lines, I used fewer drips which made the chevron design more defined. Do you notice how the gold lines don’t have drips? For those lines, I used the paint from the tube which is a lot thicker, and I like having those lines without drips. If you want some lines that don’t drip you can certainly still use the bottled paint and just not do the drip technique, but I like the paint in the tube for metallic colors, so that’s why I chose that type of paint for the gold. Plus, paint in the tube is thicker, so it can help to add dimension to your canvas. 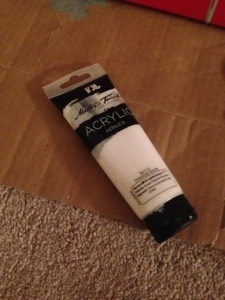 Below is a picture of paint in the tube for those of you who may not have any idea of what I’m trying to describe. Now that you’ve seen different variations, you can decide what you want yours to look like! Don’t be afraid to experiment and try new things! That’s how these canvases came about. I didn’t mean to do drips on my first canvas, but it happened so I just went with it! I would love to see pictures of what your canvases look like! Feel free to share at agirlandhercrafts@gmail.com. Thanks for sharing this, Laura! Your directions are very detailed and simple to follow. Field trip to Hobby Lobby soon! !